So it’s been a while since we have done a review here at CrossBowPistol.net. Today we are going to look at one of the cheaper mini crossbow pistols on the market. The bow in question is the 80 lb Mini Crossbow Pistol by Martial Arts. Will it be a great deal for the price or are you better off spending a little more? Let’s take a look at some of it’s features. Made from impact resistant ABS plastic – I prefer metal but ABS plastic is plenty strong. Fiberglass limbs – Standard on most mini crossbows we review. Allows for plenty of flexibility. Comes with 5 fiberglass crossbow pistol bolts – Enough to get you target shooting on the first day although we recommend you buy extras. Shoots 160 FPS – The standard with 80 lb draw weight mini crossbows that we review. 80 lb draw weight – This is debatable. We will touch on this more in the section below. Adjustable sights – Allows you to increase your accuracy. Comes with a target – Basically the target is the package it came in. Weighs 1.05 lb. – Very light and small making it easy to carry and conceal. Bow breaks on the limbs where the string attaches. – This was reported several times so this is definitely a design or material flaw. String breaks – Common complaint with many pistol crossbows. Routinely waxing the string goes a long way to making your string last. We wouldn’t count this one as more user error. Not an 80 lb bow? – Several people reported that the mini crossbow they received was actually on a 50 lb draw weight bow. Not self cocking – This bow doesn’t claim to be self cocking but we feel if it truly does have an 80 lb draw weight you want it to be self cocking. No mounting rail – Can’t add a crosshair scope or red dot scope. This is something to keep in mind if you wanted to add these. 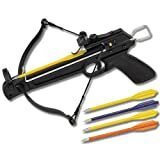 Our conclusion – Yes the 80 lb Mini Crossbow Pistol by Martial Arts did receive some good reviews and it’s one of the cheapest bows we have reviewed. But it’s just that, cheap. We feel that it’s not worth the hassle of taking a chance of getting one that won’t break. Spend $10-$15 more and buy one of the other pistol crossbows we have reviewed. You can check those our here.